To document issues, identifying who is impacted and how and who is responsible. This documentation tool was designed as part of the Safe Cities Urban Book process. However, it could easily be adapted for use with other topics. Look at all the red areas on the Urban Safety Map and identify issues that contribute to unsafe areas. Repeat this process for the amber (semi-safe) and green (safe) areas identified on the urban safety map. 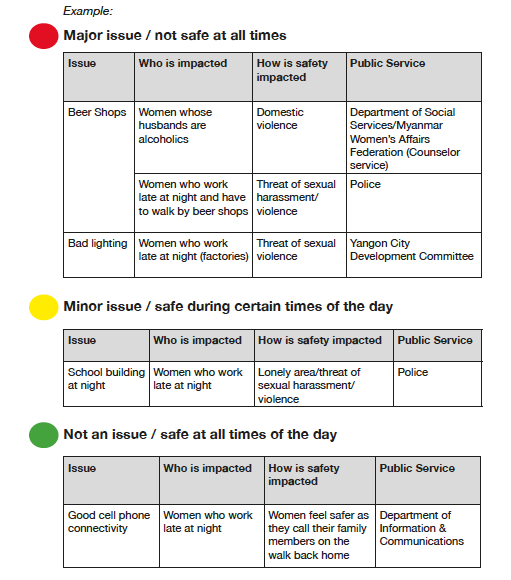 A similar matrix could be used to explore safety within a school or in a rural community, for example. In a rural area the safety issues might emerge in relation to particular activities, collecting water or fuel wood, for example.